Wouldn’t it be great if you and your family never had to worry about what a spill would do to your nice new floor? Make this dream for your home a reality when you visit our [flooring store] (Link to HP) and purchase waterproof flooring in Jackson, WY. Find beautiful, waterproof floor coverings from multiple leading national brands, and the materials you need for your next project throughout our expansive showroom. Choose from a broad selection of products, including the innovative new Downs H2O and Tigressa H2O waterproof floor coverings. When we sit down with you for a design consultation, we take the time to ask you the important questions about each room and the way you live your life. In many cases, your existing design plan may call for flooring options that may react adversely to water and moisture. If you are decorating a home that is filled with kids and pets, the pitter-patter of little feet is not the only thing you need to be concerned with. Kids and party guests alike are sure to spill their beverage with regularity, and you are the one that will be tasked with the cleanup. Choose a flooring center that puts the national buying power of the Flooring America name in the hands of their customers. We separate ourselves from the others in this market by providing our customers with personalized service, and an expansive selection of advanced products, like our waterproof vinyl and carpeting options. Each of these flooring products has been specifically designed to resist water and other liquids, and that can make your life a great deal easier when the time comes to clean up after dinner. The misconception that you get either beauty or practicality but not both doesn’t apply at our store. Our luxurious waterproof flooring made from leading-edge vinyl is proof of that. We carry materials that are ready to hold up under the dampest environments, like basements and bathrooms, and look good while doing it. Luxury vinyl is manufactured in more styles and colors than you can imagine, and its versatility is almost unmatched. 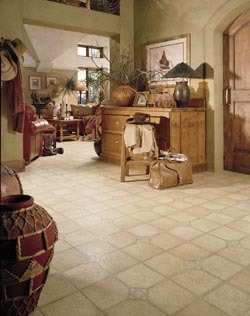 Your new floor could have the look of ceramic, wood, or natural stone without the sky-high price tag. Most importantly, you know you’re buying a floor that will last. No matter how much water ends up on the floor, the dazzling aesthetic you’ve come to love will continue to enhance your home’s décor. Hire us for installation and you’ll get even more reassurance and peace of mind, because we take the time and care to install floors well and properly the first time. We are ready to install any waterproof floor covering from our expansive inventory in the unique space you occupy, and our crews always treat your home with the same level of respect that they give their own. Eliminate the guesswork involved with decorating your home or finishing out that office restoration. Our design consultants and sales associates are ready to answer any questions you might have about our products and your design plan. In many cases, these products can solve many of your concerns while making your interior look as good as new. You may love the appearance of natural stone or hardwood, but they can’t always be placed in rooms that are susceptible to water spills. Thankfully, our waterproof vinyl floors solve that problem and they infuse any room with a modern sense of style. This material offers a softer surface under your feet and an attractive addition to your design statement that stays that way. The waterproof cores of these floors prevent them from rotting, expanding, or degrading because liquid can’t seep into the subfloor. Maintaining your new waterproof vinyl couldn’t be easier. When it begins to get dirty, all you have to do is sweep and mop. No special cleaners, no hours spent scrubbing on your hands and knees. You, your family members, and your guests will never have to worry about a dropped drink or a pet accident ever again. Our trusted brand names include Downs H2O and Tigressa H2O, both of which come from leading manufacturers in the flooring industry. We have something for every lifestyle and every room, including kitchens and bathrooms. One of our popular options is waterproof carpet, as this has traditionally been one of the toughest floors to clean when it comes to moisture and stains. That’s no longer the case with our broad array of carpets that are stain and water resistant. Not only do they not suffer from water damage, they prevent water from penetrating them in the first place. This is a level of protection that products from other companies simply cannot offer, and there’s only so much that cleaning products can do. With carpets and vinyl flooring products, all you have to do is wipe up the spill or soak up the liquid with a towel. There is no need to worry about mold or damage, and the solution is much more reliable. Save time and money on your next remodeling project by establishing a partnership with our waterproof flooring installation team. These contractors understand that accuracy matters when it comes to installing a waterproof floor covering. Any error could lead to extensive water damage, so why take a chance on a contractor that is unfamiliar with this type of flooring? Make the most of this opportunity and visit a flooring showroom with a helpful team of flooring professionals. Contact us today to find the right color and texture of waterproof flooring for your interior. We proudly serve customers in Jackson, Jackson Hole, and Wilson, Wyoming, and surrounding areas.